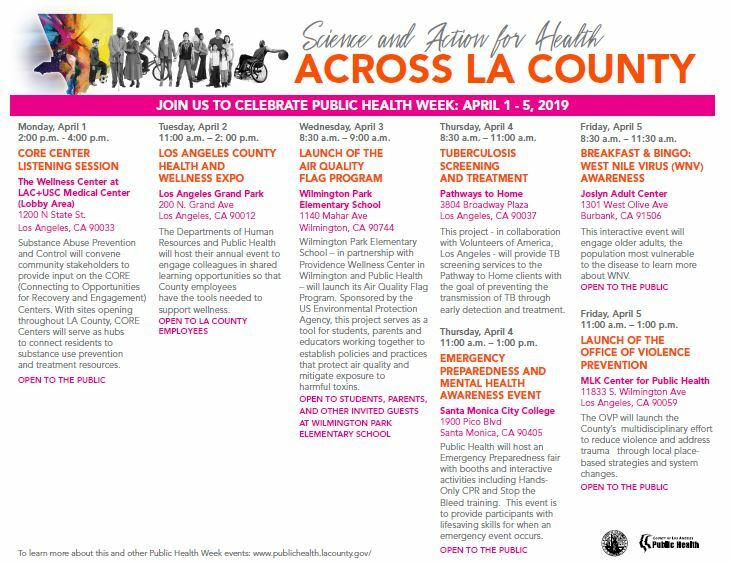 LA County is gearing up for National Public Health Week, April 1 - 5! This year’s theme, "Science and Action for Health Across LA County" recognizes the importance of science and its contribution to health. The theme also highlights the significance of building partnerships -- across county departments, academic institutions, community partners and residents – to ensure that all County residents have the opportunities and resources needed for optimal health and well-being. The Department of Public Health (DPH) is excited to host a series of events that highlight our commitments to collective actions that support a diverse workforce, thriving communities and healthy families. Our shared commitment to uplifting the community voices to enhance treatment: In collaboration with the community and stakeholders, Public Health will hold a listening session and obtain feedback and provide information on the CORE (Connecting to Opportunities for Recovery and Engagement) Centers. Several sites will be opening throughout LA County this year. CORE Centers will serve as hubs to connect residents to substance use prevention and treatment resources. Our shared commitment to promote healthy workplaces and employee well-being: The Department of Human Resources and DPH will host an Employee Wellness Expo to engage colleagues in shared learning opportunities so that the County’s greatest resource - our employees - have the tools needed to support wellness. Our shared commitment to promote environmental justice throughout the county: Wilmington Park Elementary School, students, parents and teachers in partnership with Providence Wellness Center will launch its Air Quality Flag Program. The goal is to bring awareness and adjust activities for better health and to support policies that focus on reducing emissions of harmful toxins from industrial sources in socially vulnerable communities. Our shared commitment to prepare residents to support each other during unanticipated emergencies: Santa Monica College, the Department of Mental Health along with the Emergency Preparedness and Response Division is mobilizing County residents to respond during emergencies. Hands-Only CPR and Stop the Bleeding trainings will be provided. Our shared commitment to aligning our work to ensure that everyone has the resources and opportunities to achieve optimal health: Public Health will convene partners to bring awareness to West Nile Virus, screen and treat vulnerable TB clients. Our shared commitment to prevent violence throughout the county: In collaboration with community, stakeholders and county departments, Public Health will launch the Office of Violence Prevention and expand in resources and activities within the County to reduce violence, address trauma and promote healing.